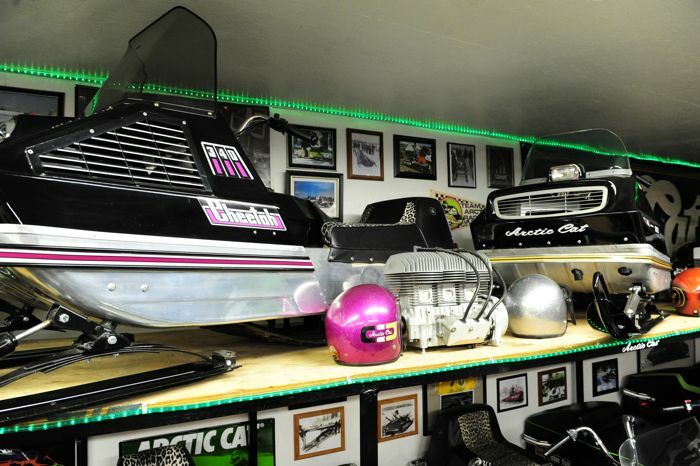 In the world of Arctic Cat collecting, Tom Ische and his wife Nancy and daughter Brianna have amassed a mind-boggling array of racing and performance snowmobiles from the Arctic Enterprises era. If there’s a bigger or more complete collection of such sleds from this era, I’m unaware of it. 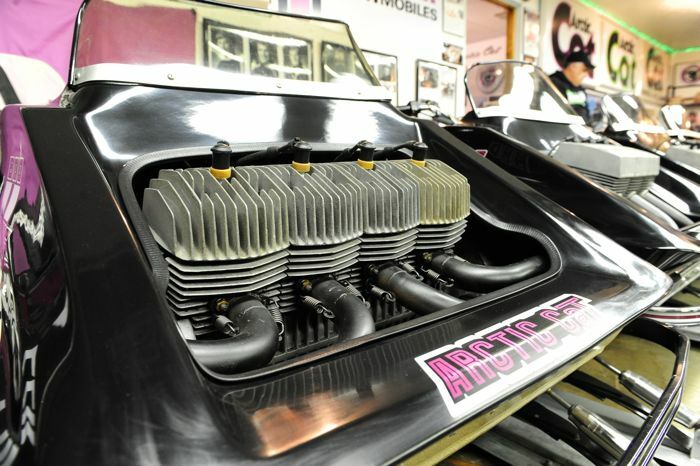 If Arctic Cat built a performance or racing sled between 1968 to 1981, the Isches have it. 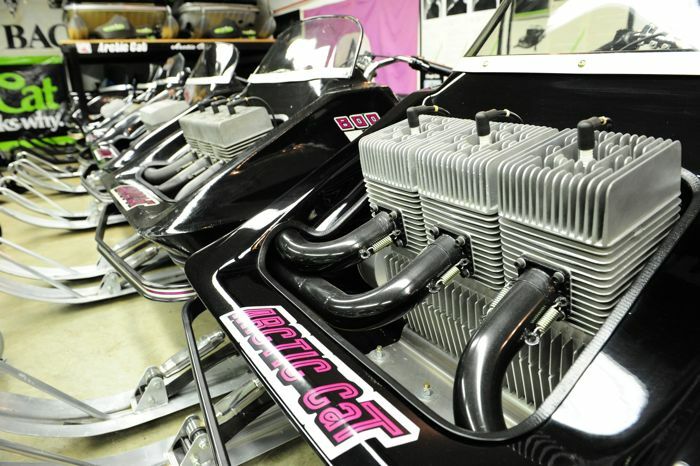 King Cats, EXTs, Puma mods, Sno Pros...they’re all here at their shop in Glencoe, Minn., most in either original unrestored or perfectly-restored condition. 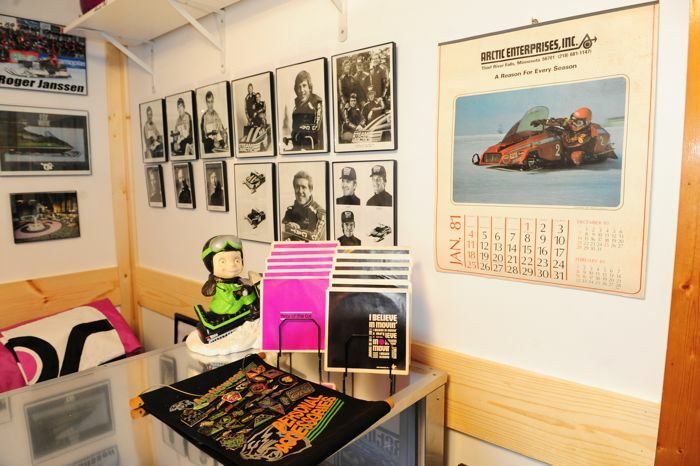 And they’re surrounded by great memorabilia from the first golden age of snowmobiling. 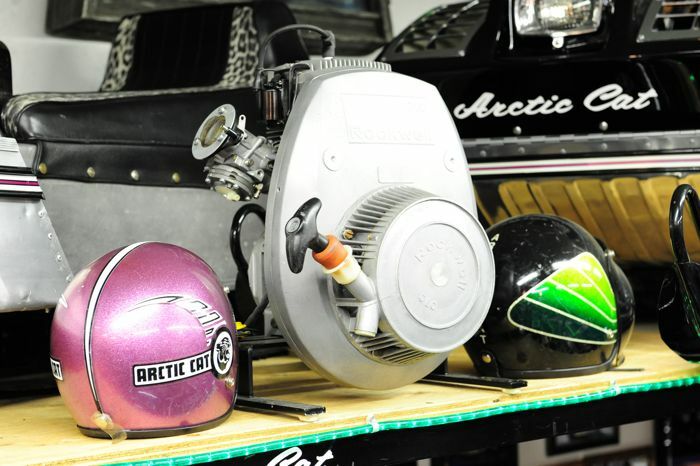 I caught up with the 49-year old Cat fanatic (who builds custom ice-fishing houses on wheels via his business Performance Engineering) at his shop a couple weeks ago, where we stared at beautiful machines and discussed how this collection came to be. 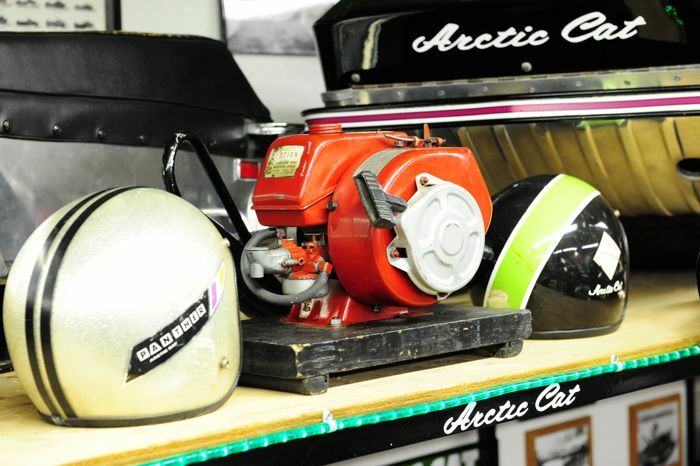 AI: When did your passion for Arctic Cat snowmobiles begin? Ische: My love for snowmobiles started when my dad bought a new Johnson snowmobile in the fall of 1966. 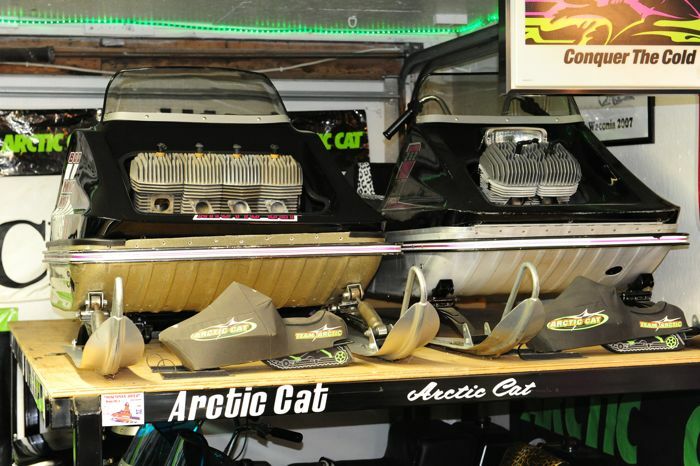 My passion for Arctic Cat began in 1972 when dad won a ’72 Cheetah in a raffle at a local snowmobile race. That sled took care of the Johnson (laughs) and so began my love of Arctic Cats. When I was 10, dad bought me a 73 Lynx 292 single cylinder. My brother got the Cheetah, and the two of us rode those sleds all the time. and I rode those two sleds. I was a Cat guy, and have never bought any other brand since. AI: Were you one of those families that stuck with the same sleds for eternity, or did you occasionally get different ones? Ische: Through the years we had Jags, Panteras, El Tigres and such. I was always interested in the race stuff. When I was 15 I bought a ’75 Z 250 with a 340 Mod kit. It wasn’t really a trail sled, but I tore around on that thing, not on trails because it wasn’t meant for that. Mostly I just rode on the creek around here, which was flat and smooth. 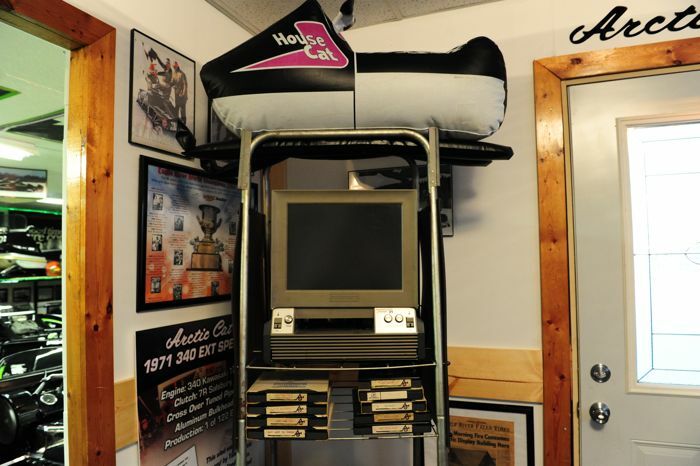 During the 1980s and ‘90s I was buying and selling sleds. I kept that first Z because I loved it so much, but everything else came and went. AI: When did you start collecting, and why? Ische: In 1998-99 I bought a second ’75 Z. I’d been dirt track racing with cars for a bunch of years and was just getting out of that sport. I sold a couple cars and my trailer. So all of the sudden I had some extra money to spend. (Laughs). So I bought a ’71 EXT Special. Then I found another sled and so I kept going. AI: The old “snowball effect!” What types of machines did you focus on, and why? Ische: I started looking for ’70 Puma mods. Not the real high dollar stuff. Then I found a King Cat. After that I started looking for ’73 EXTs... Formula IIs. I basically bought whatever I could. At first I was buying nice original machines and also nice chassis without motors. I stayed away from basket cases back then because I didn’t yet have a load of parts to rebuild with. But that eventually changed too. In the early 2000s I started calling up Arctic Cat dealers here in Minnesota, asking about old inventory, 1981 and older. I’d go in and buy everything on the shelves from that period, keeping the race stuff and selling off the common consumer sled stuff. AI: What was collecting like in those early years compared to now? Ische: There was so much more stuff available then. You could go to Hay Days and find King Cat parts, EXT parts. You could buy a 793 Hirth three-cylinder engines for a few hundred dollars. Everything was a lot less expensive then because the hobby hadn’t taken off yet. The first King Cat I bought cost $4,500. It was all original, a 9-out-of-10. In the mid-2000s, all that stuff took off in price and the inventory started disappearing. You wouldn’t see nearly as much of it at swaps, especially the sled stuff. 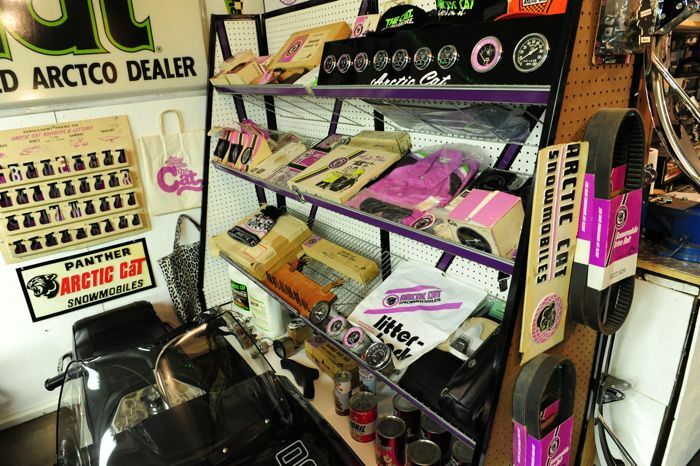 You could still find collectibles like oil cans and clothing. But the sleds sort of disappeared from swaps. I think eBay had a lot to do with that. AI: This hobby hasn’t been just your deal: it’s a family pursuit. Talk about that. Ische: Basically I started looking for sleds and Nancy my wife started looking for clothing and collectibles, at events and online. For many years it was a nightly thing for to sit on eBay looking for that stuff. She’s an expert at that. As our daughter Brianna got older she became really interested in it. We’d gone to a lot of shows as a family. When she was 13-14 she started to really get into the whole thing. AI: How many sleds do you have right now? 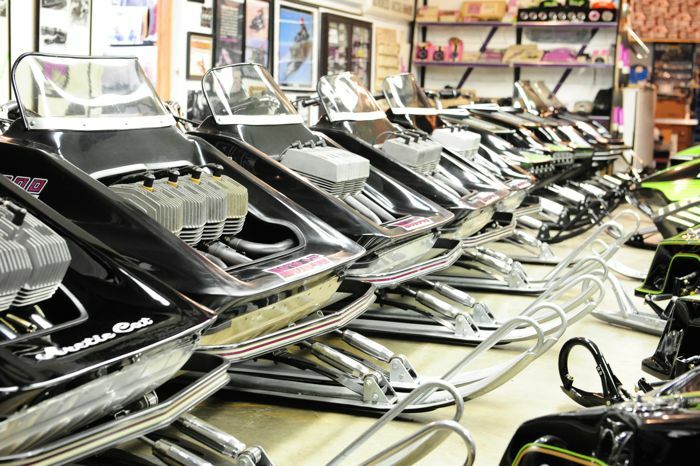 Ische: Between the restored and original stuff like you see here in the shop, we have around 56 sleds, plus another 30 projects. AI: That’s a lot of projects waiting for you! What kind of sleds? Ische: Oh, there are EXTs, Pumas, and four more King Cats...a whole bunch of cools stuff. I’ve backed off on the restorations compared to other years. I still like going up to Thief River Falls and chasing sleds and parts, that’s still fun. And I have friends that keep an eye out for stuff for me. At the point where I’m at now, I need that kind of help to find stuff. I wouldn’t have the stuff we own without the help of my friend Greg Hestekind and some others. AI: Are there any models that you don’t currently have, but are looking for? Ische: (Pause) Not really. I mean, I suppose I’m always looking for a Factory Team Arctic sled. So there’s stuff I’d still like to find. But there isn’t one specific model that I’m aiming for. AI: There are multiple aspects of this hobby: the chase; the find; the shop time; the people; the shows...from what do you get the most satisfaction and enjoyment? Ische: At first it was the chase, and going to shows and working in the shop. As time went by, I do less restoration than 5-6 years ago. You know, I spent a lot of nights in the shop working on sleds until 10 o’clock. It got to be a little too much. Now we’re spending more time as a family. Looking at the collection...we’re happy where it’s at. It doesn’t need so much attention now. 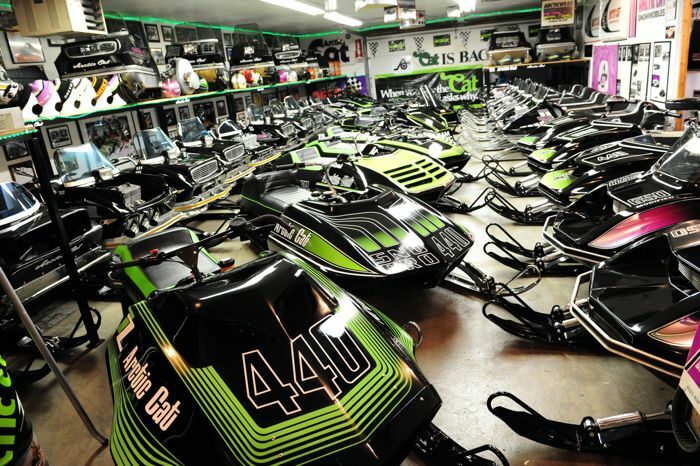 AI: Having those 30 other sleds waiting for you doesn’t feel like an obligation or a demand? Ische: Not really. A lot of those machines are doubles. For example, for a while I looked for Panther EXTs, which is somewhat rare. So I found and bought five or six of those. So I look at those sleds now and ask, “Do I want to fully restore this, or just leave it be and keep for something down the road?” I guess I’m pickier about what I restore and stick a bunch of money into it. So I don’t feel any pressure to restore those sleds, but I’m not planning on selling them either. Sometime I’ll return to restoring some of that stuff, but right now I’m catching my breath. It’s the same situation with events. Five or so years ago, we were hitting 10-15 shows or swaps each year. It all got to be a bit much and we’ve tapered that effort, picked our favorites and now hit a few shows a year. AI: Okay, it’s 10 o’clock at night, you’re done working a project, alone in the shop and you go to sit down on one of these machines. Which do you choose? Ische: I sit on quite a few of these sleds but I definitely sit on the four-cylinder King Cat the most. I can’t tell you why exactly...it’s because of the big engine, it was one of the first real muscle sleds that captured my imagination. I’ve had these sleds the longest out of just about everything in my collection. 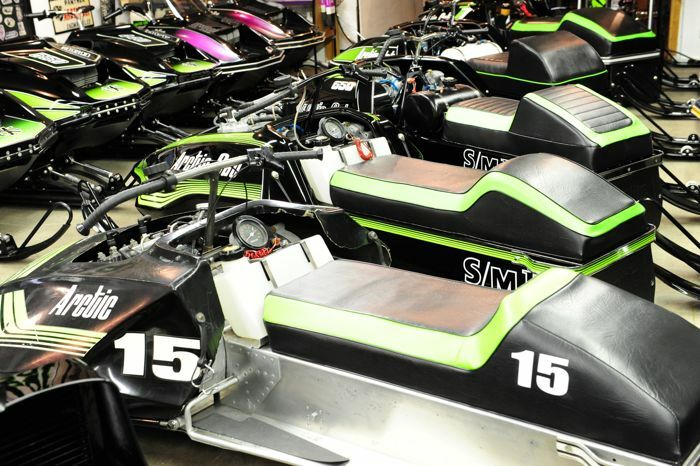 AI: Do you run any of these sleds? Ische: The sleds that I’ve restored with NOS engines and such don’t get started. But some of the sleds do. I have one 1980 Sno Pro that I’ve driven around the yard and pond, and a 793 King Cat that I’ll occasionally drive. I probably have 6-7 original sleds that I run. I’ve changed a little bit in that regard. I never even thought of riding them 4-5 years ago, but now I could see riding some of these other sleds. Doing that projects like recreating the Roger Janssen 1969 Eagle River sled are now more fun for me. That was a highlight of a winter, and that kind of stuff means far more for me than dragging sleds to shows. AI: Tell me about the big projects that are showing light at the end of the proverbial tunnel. Ische: The Boss Cat truck: a 1971 GMC that was used to haul Boss Cat I, II and III to the speed runs and, later, to events like Eagle River and such. It’s 80 percent done. I also have a reproduction of Boss Cat I I’m working on. It’s probably 90 percent done. I also have a Sno Pro from Sweden that I’m working on. And I have a ’78 Sno Pro that I’ll do right after the Sweden sled. AI: If something happened that forced you to sell all of your stuff except three machines, which ones would you keep? 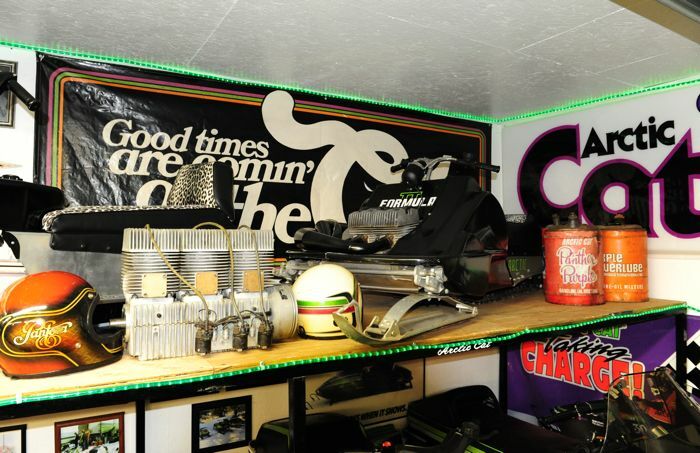 Ische: (Long pause) I’d keep the 1974 Sno Pro (above), the 4-cylinder King Cat and the 1978 Sno Pro. 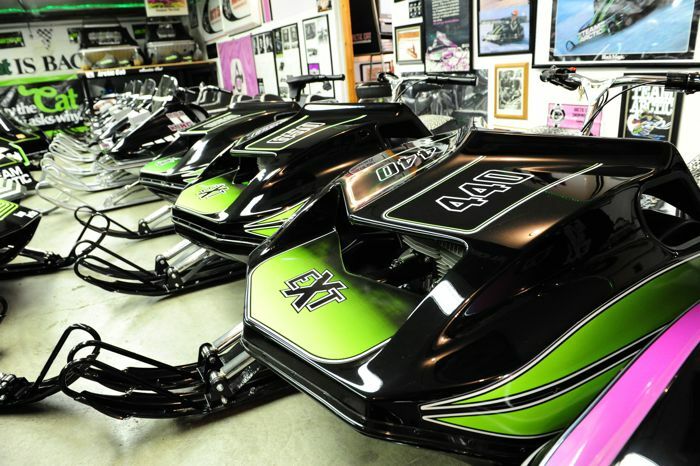 Those three sleds represent three different eras for Arctic Cat. The King Cat is the musclesled and, being a 4-cylinder, is so unique. 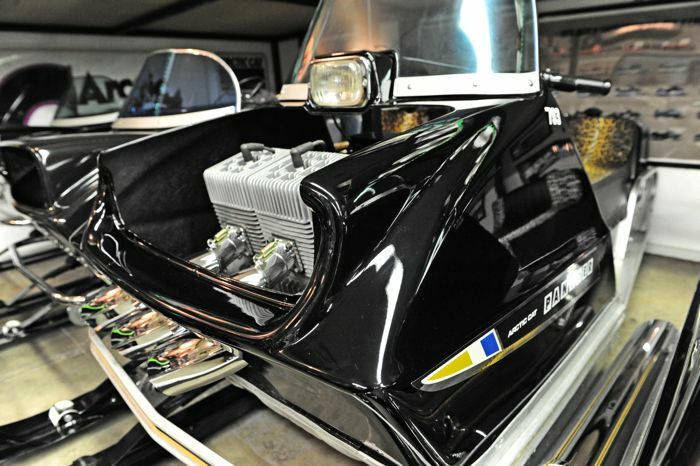 The ’74 was the first liquid-cooled sled and the first Sno Pro. And the ’78 was the start of the IFS era. I suppose that the 1977 ½ is actually the first IFS, but the ’78 was the first year they intentionally started with IFS. The very last thing I’d ever get rid of is the truck! (Laughter) Over the last two years that truck been a top priority. I’ve restored a lot cars and a lot of sleds...but nothing this big. This is the equivalent of restoring 25 sleds. It’s been a lot of work. AI: I’m looking forward to that finished piece! Do modern sleds capture your imagination in any way? Ische: I like the new stuff that’s out, like this year’s race sled. I like the racing stuff. We follow the snocross circuit pretty close, either going to some races or watching it on livestream. 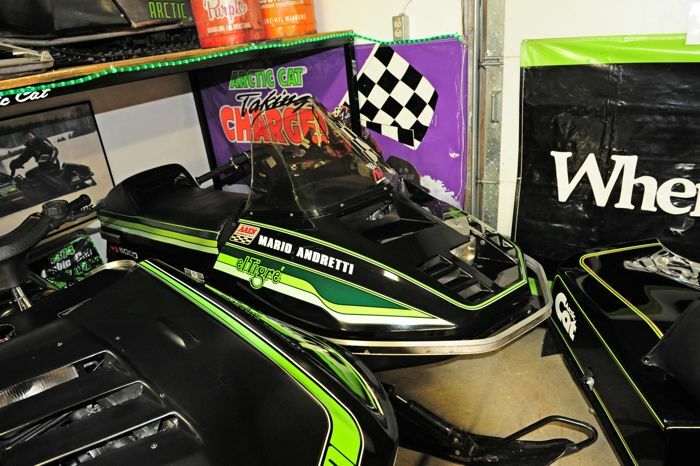 I could see starting to collect some modern race sleds. Brianna has a 2011 Sno Pro 500. 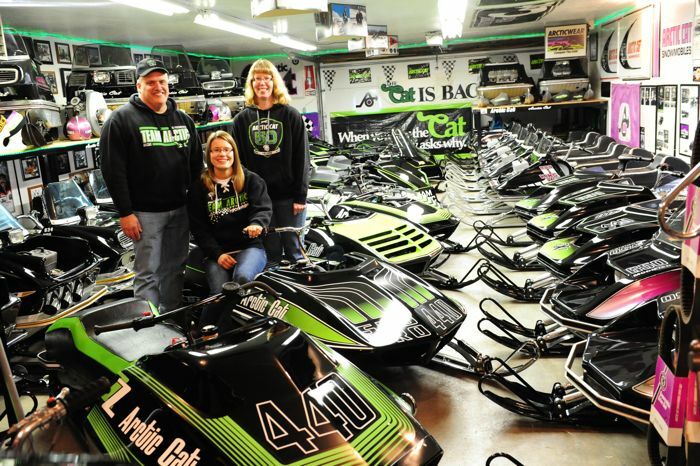 I’d like to buy one of Tucker’s race sleds some year for Brianna. She’s a huge Tucker Hibbert fan...we have a dog whose name is Tucker and a mannequin with this suit. AI: You and I have discussed the hope that, someday, people could see all this kind of history in a museum of sorts, ideally at Arctic Cat. What’s your thoughts on that? 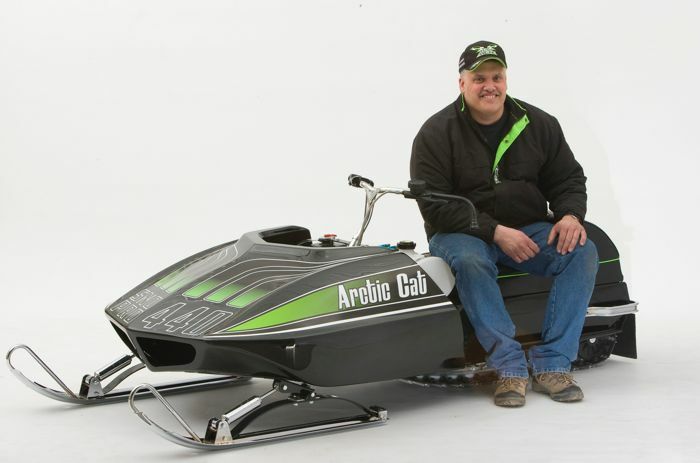 Ische: I’d like to see an Arctic Cat version of what Polaris has with their Experience Center. I’d want it in Thief River with Arctic Cat fully behind it. I’m not big on showing people my stuff here at my shop, but I would like people to see it at a museum. AI: Tom, I’ve known you for a number of years and have sat back many times and wondered to myself...Why? Why do you do all this? Ische: (Pause) If there was a Polaris or Rupp sitting there...I’d have no interest in it. But to see these Cats and to connect that to when I’d read Race & Rally magazine and see those sleds in their heyday...I don’t want to see this stuff lost or thrown under a cover. Ten or twenty years from now, when that first generation of racers and engineers is gone, will people care about this stuff? I don’t know. But I know that I do. And I want to keep this stuff going. AI: That’s a great answer, and a great transition to my last request: a Roger Skime story! Ische: I’ve met Roger many times over the years. We always talk a bit. Ten years ago, at Vintage Nationals in Thief River Falls, he and Edgar Hetteen come over and look at my stuff. Roger says to me, “These machines look so pretty and perfect. We need people like you in our engineering department.” (Laughs) I told him I’d be right there. AI: Thanks Tom, for the interview and for your amazing passion. Yes, this El Tigre was indeed once owned by Mario Andretti. Way cool...What a collection ! I would love to see that in person, way cool!! Id like to start a collection of 90's and early 2000's triple muscle sleds. I have had 97 and 00 zrt 600's, 2001 zrt 800 and 2001 Thundercat. Great sleds. WOW AND DOUBLE WOW! My checkbook is out and ready to go!!! Items that are for sale please!!!!! What a collection! If these ever end up in a museum, i'll buy the first ticket to get in and see them. There is some really rare stuff in there. i remember seeing this family and their cats at the 50th anniversary in trf. the sleds are perfect better then new. 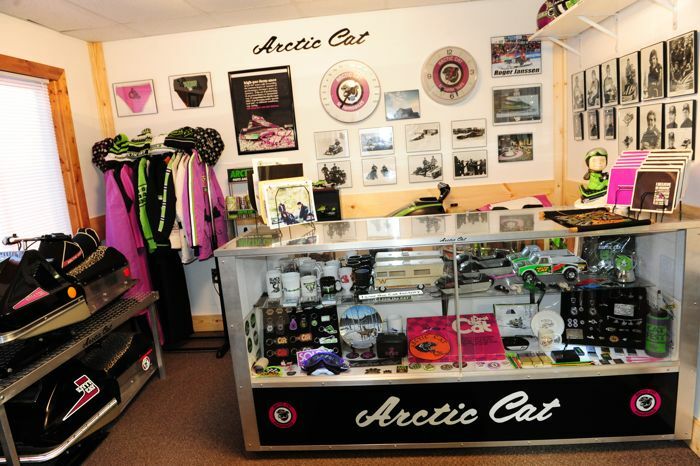 i hope that arctic cat has another anniversary party this summer and i hope that a museum happens. i would keep going back to trf for both. thanks to tom and his family for showing the collection. Paul: It's okay that I ask Tom Ische what three sleds he'd have to choose to keep after spending untold hours, dollars and energy sourcing, rebuilding and caring for a 50-some machines, but it's NOT okay for you to ask me which one I'd have to choose to ride. LOL. For a couple decades (and based on seeing most of these machines only in pictures, not when they were actually on the racetrack), my favorite looking Cat was the 1976 Sno Pro. 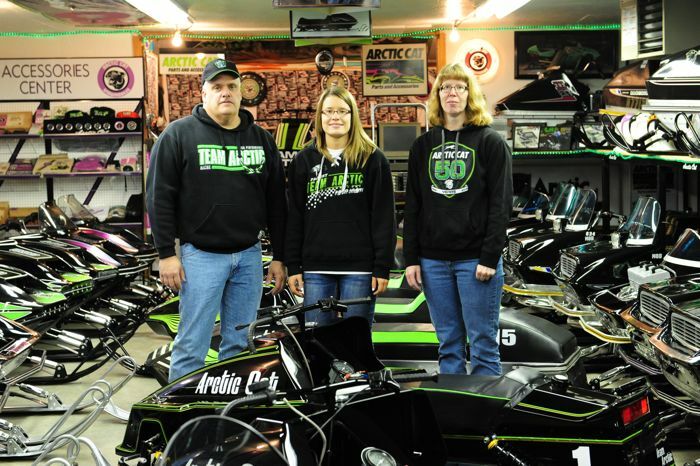 But then I did an extensive studio photo shoot with the Ische's for the Arctic Cat 50th book. I got to see and even sit on that and a whole bunch of other sleds. The '76 is still powerfully beautiful and graceful in appearance, but that '74 Sno Pro literally took my breath away. The '81 Sno Pro right "there" too. Those three sleds are as close to visual perfection as I've ever seen. As for which one of those three I'd pick to ride? Would be tough to choose between the 74 and 81.
back in the early 90's, cat had a mini museum in the lobby of the factory. If my memory serves me correct there were at least 20 sleds in there. along with a wall full of old advertising. I wonder what ever happened to all that stuff? 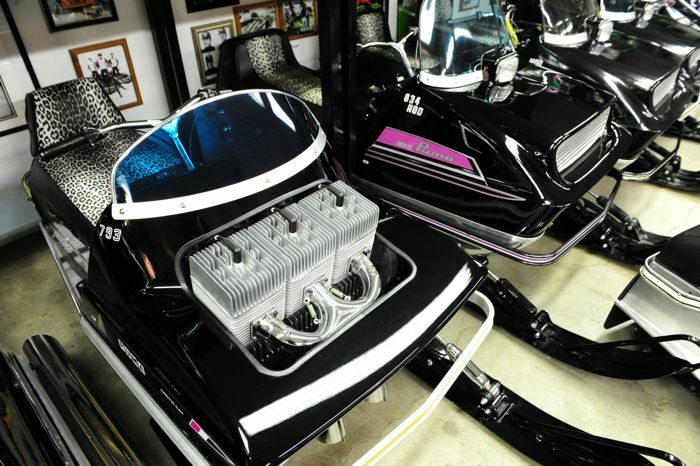 These are such a work of art, I love seeing the familys collection at the vintage shows during the year, I cannot wait to see the boss sled reproduction! Beautiful collection! Thanks to the Isches for sharing with us. The passion is amazing. 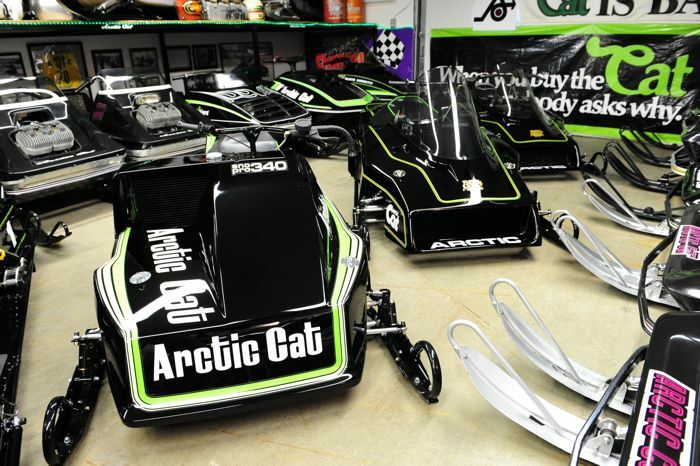 I think a big thanks need to go to Cat for designing and building such amazing looking sleds over the years. 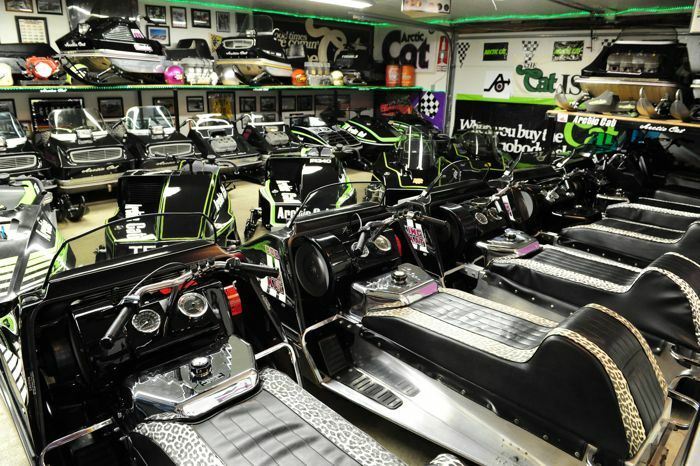 No other sled company comes close to having such a lineup of unique and amazingly styled machines. Absolutely amazing! I think I died and went to heaven. I would love to see this entire collection in person. Yes Arctic Cat we need the museum! My passion and love of Arctic Cat has been forever. 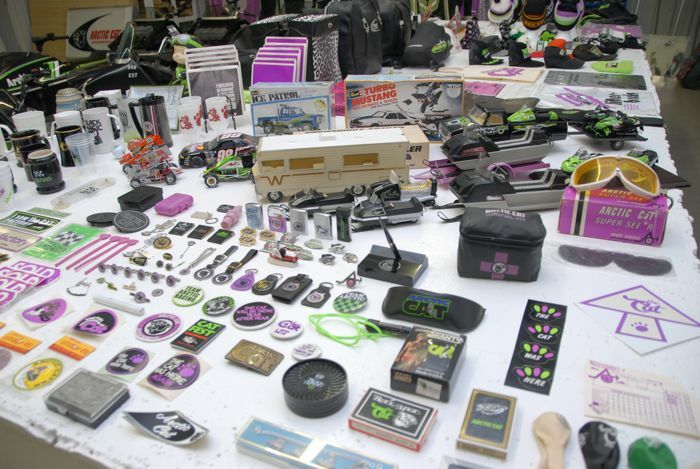 I love all the items and sleds that Arctic Cat put out in the 70s and 80s. 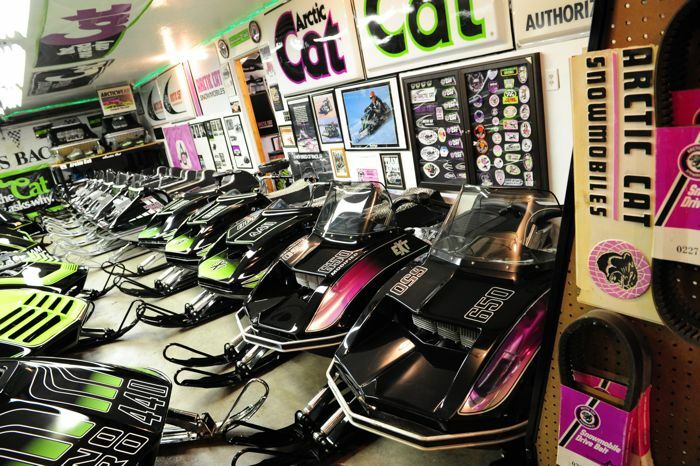 I know of no other sled brands that had as many as Cat did. Thank you Ische family for sharing this. It is so cool to see his wife and daughter involved too. A stunning collection to say the least! It would be wonderful if it could be put on display some time, there is so much history and memories associated with these machines for us Cat heads. Also what an unbelievable amount of work and time and dedication has gone in to restoring them, they are awesome. Thanks for sharing. Awesome collection and story. You didn't happen to snap any photos of the Trucks did you? Beautiful and purrfect collection Tom. I just sold my near perfect 72 EXT 440 Modified triple to a collector in Illinois. I really wanted to keep it, but I have other priorities now with a granddaughter due in 6 weeks. I had my fun with it. I've been a Cat guy since 1971, when I was 15 years old. Beautiful collection. Thanks for the memories. I have for sale an original men's XL Arctic Cat snowmobile suit with the purple and black cat emblem on the back. Its in really good condition. Would you be interested? OMG!!! I would LOVE to come there and see that Cat collection!!! We were a Cat dealer in that area..... Raced 650 (73) EXT Formula11(with a 440 in it) and own a 77Z to this day! Is it possible to see ur collection some time Tom?? Im a 100% CAT guy!